Happy Talk is a good way to describe the sound Kermit manages to blow out the face of his horn on the first release since his audience has grown via his role as himself on HBO's Treme. Ruffins seems to have jumped at the chance to broaden his appeal, while keeping what makes him a vital artist that links New Orleans past with it's present. Employing orchestra's and seasoned players to match his comfort zone BBQ Swingers he digs in and tightens up at times doing an admirable job with classics. His smile seems to constantly emanate from the trumpet as Kermit plays standards and a few of his own compositions with ease grace and a certain laid back charm even if it takes a few songs to fully shine through. "Panama" and "La Vie En Rose" are too buttoned up for the man with the horn, and while showing some classical charm they remain restrained and maybe a different tracking order would have helped out. The albums centerpiece and overwhelming highlight is the 9 minute "If I Only Had A Brain" which incorporates calypso rhythm's and vibes playing up the daffy charm Kermit possess and shows off on the regular. Herlin Riley's percussion here is flawless, loose enough to be inventive but never sloppy, he is the MVP with a brain. After this midpoint shining moment the album clearly picks up steam with "I Got a Treme Woman" and scurries around with a jiving "Shine". Happy Talk culminates with Ruffins blowing, grooving and singing an ode via "New Orleans (My Home Town)" which fits the traditional jazz innovator perfectly. A foot in the past a head in the future and a mouth that manages to convey it all with his trumpet playing and band leading, Happy Talk finds Kermit doing what he does best. Happy talk is a joyous album that makes it hard to feel down during. It does feel a bit too constrained at the start but ends with enough vitality and flair to pump up the feelings. 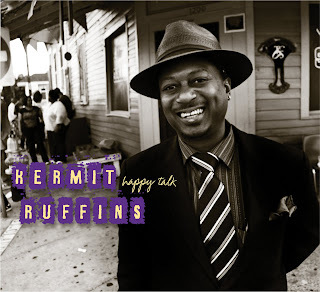 Kermit as an artists is a great link back to Louis Armstrong and a host of others and is critical to today's scene having invented Rebirth Brass Band, but having seen him a few times this album can feel a bit too stuffy at times compared to his looser rhythmic playing with the BBQ Swingers. "Panama" not my favorite from the disk, but a BOOSH-tastic video.